Spend an afternoon on the river while indulging in a leisurely afternoon tea cruise on the River Thames. Enjoy a fresh selection of cakes, sandwiches and scones served with lashings of cream and jam. Sit back, relax and sample a limitless supply of afternoon tea on a cruise that is an ideal end to a busy day of sightseeing or shopping in London. An afternoon tea cruise on the river Thames provides an elegant setting for a light bite to eat in a refined, sophisticated atmosphere. Take a break from the frantic pace of city life and set sail with good friends and great food while taking a unique look at some of the Capital's most famous landmarks. Unwind in the company of Big Ben, St Paul's Cathedral and Tower Bridge as you sail right through the heart of the Capital on-board a vessel with giant panoramic windows and an open air observation deck offering unobstructed 360 Degree views of the city. For more City Cruises options see City Cruises London Thames Cruises. A selection of delicious sandwiches, scones with clotted cream and strawberry jam, a selection of traditional cakes and unlimited tea and coffee or soft drinks for kids. NOTE: Please advise any dietary requirements (including vegetarians) when booking. Tower Pier is close to Tower Hill underground station, Tower Gateway DLR station, and London Bridge train station is not far off. The pier is located almost directly opposite the Tower of London. The staff was fantastic and so lovely and cheerful, beautiful day, lovely experience! We did this to kick off a hen weekend and it was lovely! Unlimited tea and coffee with a great selection of sandwiches and cakes! Highly recommended! I’m normally lazy with reviews but this needs one. It was such a great well orchestrated afternoon. The staff were brilliant and the afternoon tea was one of the best I’ve had. Thank you ! Really pleasant experience and good value for money. Duration is long enough to enjoy your tea and then go up to the top to take in London's views and all the staff on board were very nice and polite. 4 star due to no choice of teas and also scones all come with raisins, whilst other afternoon teas offer a variety. The commentary on the boat is inaudible over everyone talking whilst having tea so is more of distraction (maybe not have it?) I would definitely recommend this experience at the discounted price point. Decided to do this cruise with afternoon tea for a valentines day surprise. There was a gluten free option, which exceeded our expectations. We got a window table for 2, and the weather was fine, so all this made a great day out even better. The sight seeing commentary was a bit hit and miss, and not very loud, and we didn't take much notice of it. Service was excellent, it was exceptional value for money. The whole family really enjoyed it. Service was excellent and the whole experience was memorable. The only downfall was not being able to really hear the auditory guide.... not sure how this could be improved though. We do not certify that products are free from nuts or traces of nuts. Images are for illustration purposes only and do not necessarily represent the event. Please note: this cruise is NOT wheelchair accessible. Any disabilities must be disclosed at the time of booking. All passengers on dining cruises must be physically able to walk on to the boats with an able bodied helper and unfortunately no electronic wheelchairs are permitted. Excellent service, excellent food. Highly recommend. We had a fantastic time. Thanks. Booking was straightforward, afternoon tea quality very good. Would definitely recommend discount London and city cruises. Great way to see the sights of London from the river whilst having afternoon tea. It is easy and relax to enjoy the Thames with a good afternoon Tea. 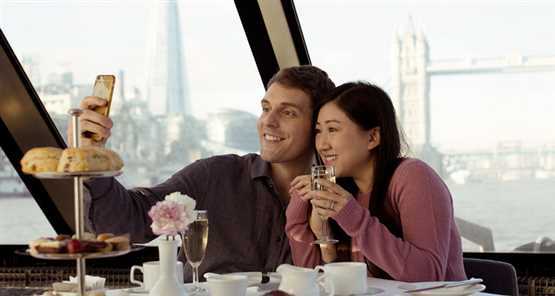 All of us are enjoy this trip and highly recommend to people save time and enjoy afternoon tea and the Thames one time. Went to celebrate my daughter’s 21st. Initially booked the Tea but then they were unable to do it on the day so we were offered the lunch cruise instead. Lunch for 16 of us was very good. All of us enjoyed the cruise. The weather certainly helped glorious sunny mild day in November! Would have liked to have gone past the Houses of Parliament though. The boat turned round just before them. Can’t fault the staff and the food was good too.